Summer [K7080] - $6.80 : Yarn Tree, Your wholesale source for cross stitch supplies. 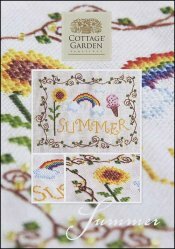 Cross stitch design by Cottage Garden Samplings. A cheerful summer design with a rainbow, a sunflower, and an icecream cone. A vine with green leaves borders the design. Stitch count 93w x 71h. Stitched on 32ct Belfast Linen.